My last day, Wednesday, arrives like a bottom-hitting roller coaster. The momentum builds as the days climb towards the apex of Tuesday night. Wednesday arrives as a crashing descent, slipping into the smooth arc of Wednesday evening. Once, I relished the late Thursday social dinner with me and 16,500 of my peers, either in Embarcadero Park or Balboa. I can’t justify spending time away; I’m a one-man shop. Each day I spend away simply makes me fight the Battle of Time Compression; more work in less time. My due dates do not change. Wednesday was my Map Gallery day, and a day to see how campuses are using GIS to manage facilities. Change your perception of campus for a moment. Some college campuses cover a 1/4 to 1/2 sq. miles. An acre contains 640 acres; the University of Missouri’s main campus covers 1,262 acres, more or less, or about two square miles. I specify “main campus,” as UM also maintains experimental fields for agricultural research. Managing a college campus is administrating a small to medium-sized town. College campuses have utilities, powers stations, water and sewer lines, police departments, roads, telephone and internet, everything a city has, and many of the same concerns. The GIS guru from the University of Missouri-Columbia has worked hard, for a long time, to get his campus a fully functional living-and-breathing GIS for the MU campus. 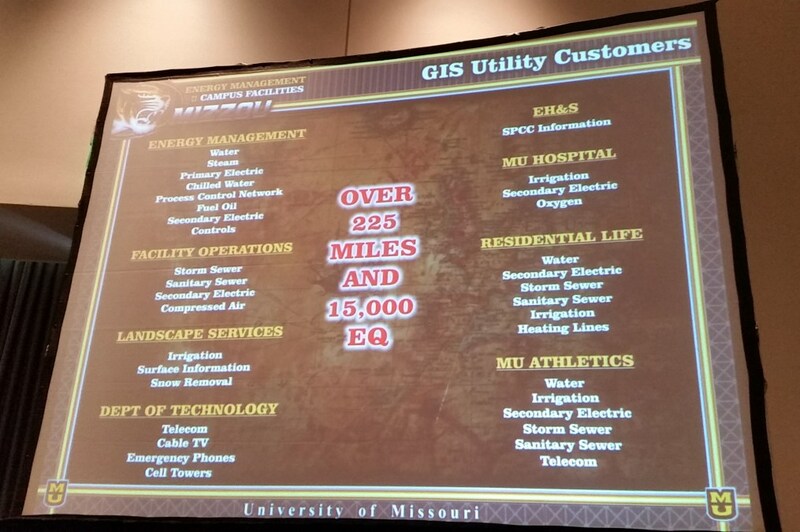 MU built their GIS over time, improving and adding as able. As GIS evolved so did the MU mapping ability. Mapping pipes and sidewalks improved from simply lines connecting buildings, to showing true paths, to showing the actual scale and details of infrastructure components. Everything was built in-house, using local talent, and faculty, staff, and student effort. University of Missouri, using their unique intellectual capital, over 20-some years, developed and continue to modify their campus GIS. A GIS which in any other environment would resemble the GIS of a town or small city. From their effort, faculty, staff, and most importantly, students, gain necessary skills directly translatable into real-world employment. If you work on a college campus, as I do, GIS must become an intrinsic aspect of any campus management system. If GIS is not a part of your campus’ approach to managing facilities, then the campus has a problem. North Carolina Agricultural and Technical State University (NC A&T) has roughly 8,900 students and covers 713 acres; a little more than a square mile. Dr. Tony Graham engages his students in projects to help their campus improve facilities management as part of normal coursework. 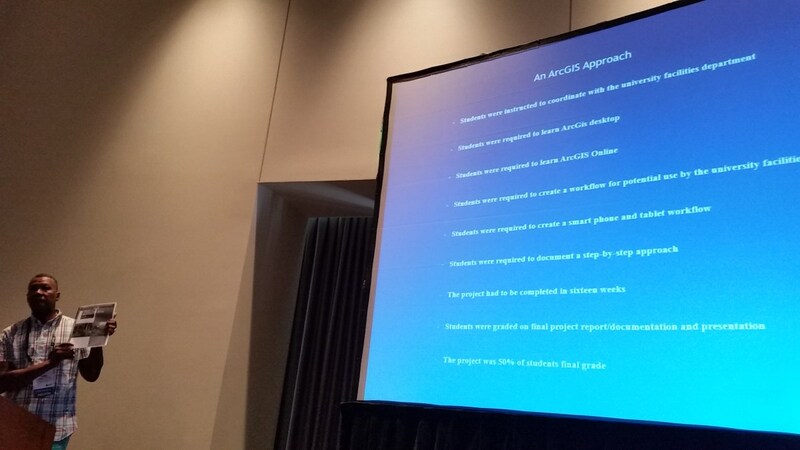 Each semester, Dr. Graham allows his students to choose a project, a project which will either fill in gaps in the infrastructure database, or augment, improve data. The results of his students work is then merged with the university’s management scheme. The students are not engaged in pointless academic exercises but working on solving real-world problems and gaining real-world experience directly translatable into employment. These stories are important. Yes, managing infrastructure is critical; being able to provide utilities consistently is fundamental to the mission of other campus offices and university mandates. While these are the proximate reasons for GIS on campus, greater reasons exist. Every student who experiences working in the campus facilities management accomplishes three goals. First, the student gains invaluable work experience in a true mapping environment. Second, the campus facilities are improved and advanced. Third, the campus potentially saves money by using in-house expertise, and developing in-house expertise. In fulfilling these three goals the university acts as good stewards not only of public monies but of producing educated, productive, and experienced people, therefore safe-guarding public trust. In many ways, higher education is a steam-powered locomotive. Point the engine in the right direction, lay the tracks straight and true, provide a concrete destination, and watch the good be delivered. The engine and transported cargo is not nimble. Once the engine gains momentum, the cumulative mass of all cars heading the same direction, much planning is required for all incumbent energy to dissipate in order to slow or change course.